This Fisherman large copper finish pendant lantern with seeded glass shade features a circular ceiling mount and chain link suspension, retro industrial style downward facing lantern, with large wide brimmed rim and clear seeded bell glass shade. A fantastic addition to any room in the home and particularly suited to over a dining table, kitchen diner, living rooms and hallways. The seeded glass dates from the last century and was originally as a result air bubbles trapped within handmade glass. This shade is no different but now it’s been done intentionally, with plenty of small air bubbles which give a stylish water droplet effect that looks fantastic. The retro industrial style and on trend copper finish makes it suitable for traditional and contemporary spaces. Height adjustable at the time of installation by removing chain links, please see the technical information below for exact dimensions. There is a matching Fisherman 3 light pendant and wall light that can be viewed below. Please follow this link to download or view the installation instructions. 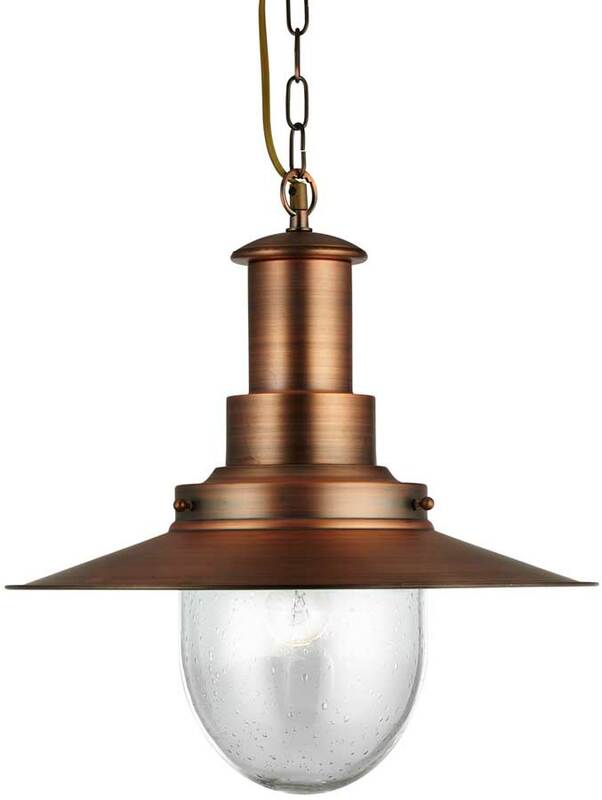 Supplied by Searchlight who manufacture some of the best traditional and modern classic designs such as the Fisherman large copper finish pendant lantern with seeded glass shade you see here.